The municipal water supply here in Millcreek, Pennsylvania (next to Erie), leaves a bad taste in my mouth - literally. It's hard to make a good cup of coffee with bad water, so I decided to install a high quality water filter. The water pressure for the supply line is pretty good, so I figured that pressure reduction due to the filter's presence would not be too bad. I was wrong. In retrospect, this was not really a surprise since I have installed the same type of filters in other houses and had a reduction, but the street pressure is higher here so I thought the output would be high enough. After about two years of having about half the water flow from the cold water faucet as from the hot, I decided to do something about it. Changing the filter helped a bit, but not much. So, I figured it was time to test the theory of equivalency between water pressure and electromotive force pressure (voltage) when applied through parallel resistances. In this case the resistance is provided by the water filters and the pressure is provided by the town's water supply. The picture below shows how I accomplished the plumbing (equivalent of wiring in an electrical circuit). A couple "T" fittings provided the connection nodes. The water supply can be thought of as the positive terminal of a battery (anode) and the sink's drain can be considered the negative terminal (cathode). 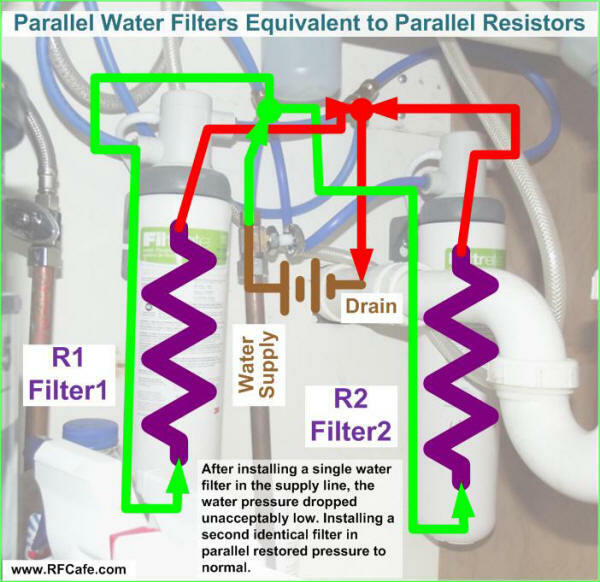 Theoretically, if each filter dropped the output pressure by a half, then paralleling two of them should restore pressure to full. Of course if each filter individually only reduced the output pressure to 75%, I would not expect to see an overall gain in pressure above the input pressure (50% increase in this case). Otherwise, I would be able raise the pressure indefinitely simply by adding more filters in parallel. I have a page showing equations on how to calculate series resistors and parallel resistors in electrical circuits.